The Vijayanagar Dynasty and its Empire was founded in 1336 in the Deccan Plateau area of South India (now Karnataka). Established by two brothers of the five sons of Sangama, Harihara I and Bukka, Vijayanagar became one of the greatest empires of South India. The period of Vijayanagar Dynasty dated from 1336 to 1646 and was last ruled by Emperor Krishna Deva Raya before it got conquered by the Delhi Sultanate. It was during the Vijayanagar dynasty that the art, literature and architecture in South India developed at its best. It the legacy of painting, sculptures and architecture of the Vijayanagara period that placed the rock-solid foundation in the regions of South India. The literature such as Kannada, Telugu, Sanskrit and Tamil thrived during the era and Carnic music got the stature of what it is today. In this blog, we will be discussing about the historical monuments built during the Vijayanagar dynasty. The art and architecture during the Vijayanagar architecture was widely classified into courtly, religious and civic architecture. The Vijayanagar style was a perfect amalgamation of Hoysala, Chalukya, Chola and Pandya styles that existed during the earlier centuries representing serenity and simplicity of the old times. What made it so popular were its durability and the key building element – the hard granite. This was the one similarity it had with the Badami Chalukyas of the Chalukya dynasty. Nevertheless, it also used soapstone as a major building source for sculptures and reliefs. There was a great extent of cultural contribution of Vijayanagar Empire in the development of art, literature and architecture in South India. During the period of Vijayanagar dynasty, Hindu temple architecture underwent tremendous innovations and brought about various styles and traditions of temple building in South India. Some of the exemplary examples of Vijayanagar architecture are the remnants of Hampi in Karnataka. The temples built in the capital city Vijayanagar was from the period of reign of Harihara I to Sadasiva Raya (1336-1570 AD). The Hindu temples in Vijayanagar were surrounded by strong boundaries and defined by tall ravagopurams (carved towers at the temple’s entrance) and ornate-pillared Kalyanamandapa (marriage halls) built using brick, wood and stucco, same as in Chola style. These Vijayanagar Empire temples were a dwelling for the life-sized idols of Hindu Gods and Goddesses. While Krishnadeva raya ruled the empire, Dravida style of turned out to be popular which continued as the key architectural styles of temples in South India built in the next two centuries. Vijayanagar temples are still known for the carved pillars characterizing scenes from Hindu mythology, charging horses and hippogriphs called yali. Out of the many temples built during the period, some are dedicated to male deities with their female counterpart adorned in a separate temple in the proximity. Both the genders of Hindu deities dwelled and were worshipped in different shrines. Virupaksha Temple is a recognized UNESCO World Heritage Site in Hampi. Located in the Ballari District in the state of Karnataka, Viryupaksha is a significant part of the well-known group of monuments in Hampi only the remnants of which are found today. The temple was constructed under the reign of King Deva Raya of the Vijayanagar Empire. Dedicated to an incarnation of Shiva, Virupaksha, the temple remains settled on the bank of River Tungabhadra and is an important center of pilgrimage in Hampi. The temple is the only surviving building amidst the ruins of Hampi. How to reach: To explore the capital of Vijayanagar Empire and pay homage at Virupaksha Temple, book cheap flight tickets to Bengaluru and book a car or get tickets in a train to Hampi. If you want to explore the historical destination anytime soon, book cheap last minute flights now! Hazara Rama Temple is another important shrine built during the Vijayanagar period in Hampi. This beautiful and small temple is centered to the royal area in the town of Hampi. Built by Devaraya II, the then ruler of Vijayanagar in the early 15th century, Hazara Rama Temple is dedicated to Lord Rama. Considered as the private temple of the royal family, Hazara Rama is greatly famous for its panels and bas relics depicting scenes from the Ramayana. The temple was initially built as a normal structure with pillared hall, sanctum and ardha mandapa. However, later the Vijayanagar monument was reinvented adding beautiful pillars and an open porch. How to Reach: Make flight tickets to Bengaluru and choose the best suited option of car bus or train from the metropolitan city. Booked business class flights to Bengaluru for a meeting? 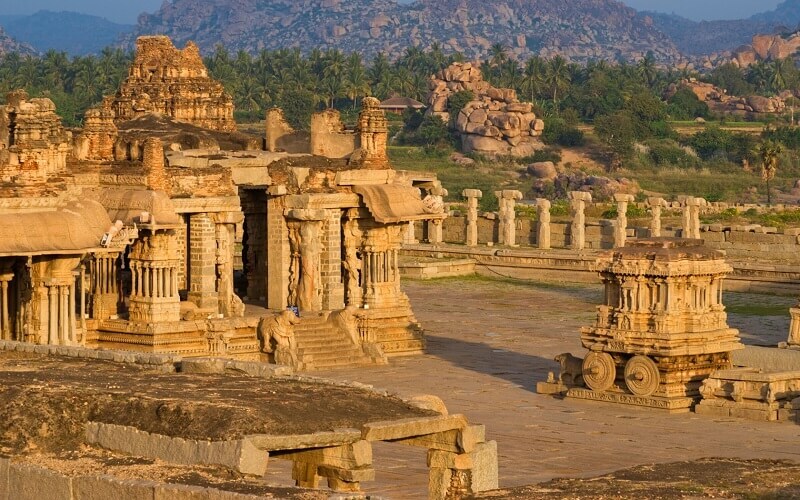 Spend the following weekend exploring the remnants of Vijayanagar Dynasty. The entire town of Hampi and its temples, earlier called Vijayanagar (the capital) was established by the Vijayanagar rulers. The temples of Hampi are popular all across the globe for their florid ornamentation, stately pillars, intricate and bold carvings, spectacular pavilions, large dimension and the depictions from the incidents of Mahabharata and Ramayana. Along with the two stated above, there are some other important names you must explore when in Hampi – Krishna Temple, Vitthala Temple, Pattabhirama Temple and Chandrashekhara Temple. Along with these Hindu temples, you will also find remnants of some Jain temples from the Vijayanagar dynasty.